Home > How Your Body Works > Ever wonder what happens when you eat carbs? Ever wonder what happens when you eat carbs? As I’ve been focusing on carbohydrates in my research thus far, I wanted to build a “foundation of physiology”, if you will, to build all the dietary recommendations on. If you’re a science geek, I hope you’ll enjoy this with me. If you’re not a science geek and you’d rather mow grass with fingernail clippers than read about the way your body works, stop reading and come back tomorrow. I promise to post a delicious new recipe for you then. Now, on to the nitty-gritty. Carbohydrates are the primary source of energy in grains, fruits, dairy, starchy veggies (potatoes, beans, etc. ), and sugar. Depending on the type of food, the carbohydrates are either long chains of molecules (complex carbohydrates), or short chains or single molecules (simple carbohydrates). Once you put these in your mouth, your body gets right to work. An enzyme in your saliva starts breaking the bonds between the molecules. It usually doesn’t get very far, because most of us swallow before it has a chance to break all of the chains apart. My sixth grade science teacher used a neat trick to demonstrate this breakdown by giving us each a saltine cracker and told us to chew on it for at least a minute. Eventually, it started to taste sweet because the carbohydrates were being broken down into their individual sugar bits…pretty neat, huh? Anyway, then you swallow and the food goes into your stomach. Not much happens here in the way of breaking apart the carb chains, because your stomach contents are too acidic for the enzymes to work. After your stomach has done its thing, the food passes into your small intestine where most of the magic happens. Another enzyme (dispatched from your pancreas) goes to work breaking the rest of the bonds in the chains of carbohydrates. You are basically left with single molecules known as monosaccharides. You may be familiar with their individual names: glucose, fructose, and galactose. I’m only going to talk about glucose for now, because that’s the most prominent player in your energy pathways. Glucose molecules are transported into your intestinal cells and then pass from there into your blood through a variety of methods. If you have ever heard of someone testing their blood glucose or their blood sugars, they are essentially measuring how many of these glucose molecules are floating around in their blood at any given time. Some of the glucose then goes to the liver for storage, and some of it needs to get into your body’s cells to provide you with energy. To get out of the blood and into most of those cells, glucose needs help from a hormone called insulin. Think of the glucose molecules in your blood as people walking on the street, and the cells of your body as locked houses. 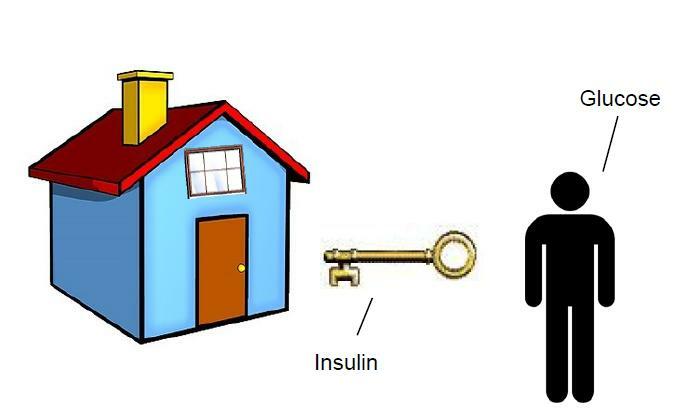 The glucose can’t get into the houses without a key – in this case, insulin (as you can see in my highly sophisticated diagram above). Once it’s in your cells, it can either be used to make energy right away, or stored away in long chains called glycogen until your body needs energy later. If there is more glucose left over when all of your body’s glycogen stores are full, then your body converts the glucose into fatty acids and stores it away as body fat. Furthermore, that extra glucose actually tells your body to use less of your body’s stored fat for energy. Now before you go scolding your body for this process, remember that it came from the survival instincts of our ancestors who often lived in times of either feast or famine. While there was plenty to eat, their bodies stored fat to sustain them in times of hunger. The problem for many modern-day people is that they constantly live in times of plenty. When people go on low-calorie weight-loss diets, their bodies will start to use that fat (and unfortunately, muscle) to fuel them. Now I’m definitely not advocating that we all just run off and haphazardly quit eating carbohydrates to lose weight. There are definitely pros and cons to be weighed, and for now I’m an advocate of age-old moderation. In agreement with the information I referenced in previous posts, my textbook on metabolism states that (as of 2009) researchers have yet to determine the ideal balance between carbohydrate, fat, and protein intakes for fat loss. Clearly, there is a balance to be achieved. So there you have it – a snippet of your body’s complex innerworkings. Maybe now you and your body will have more to talk about!